1/8 of pie = 1/2 vegetable serving This delicious pie makes it's own "crust" while baking. My mother-in-law gave me the recipe. 2. Gradually stir in water until well mixed. 3. Spray a 9-inch pan with cooking spray. **Keep pie chilled after cooking. Recipe submitted by SparkPeople user JESSICAB1221. My whole family loved this! I substituted pumpkin pie spice for the cinnamon and used egg whites instead of egg substitute. It was really easy and turned out great! This is a great recipe, but I wanted to calculcate how different it would be if Splenda and Splenda brown sugars were used. It dropped the cals from 133 to 104 and the carbs from 28 to 21. 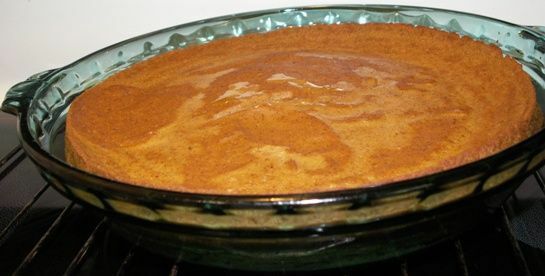 My husband is diabetic and alergic to cinnamon, so whenever I make a pumpkin pie I use 1t. cloves, 1/4 t. ginger, 1/4 t. nutmeg, 1t. vanilla extract. I also used Splenda, it works well. The nutritional content is calculated correctly. I used the nutrition facts from the box of Carnation Instant Dry milk. How moist, and delicious, thank you for sharing!! Great idea! How many minutes did you bake the smaller pies? Thanks for pointing that out! I don't bake/cook gluten free so I didn't know that. This is SO good! It turned out perfectly and is completely delicious! This "pie" had no crust at all, but it was still very very good. It was the perfect texture. It looked puffy when I took it out of the oven, and I was a bit worried, but it settled as it cooled. The pie isn't supposed to make a typical pie crust. It does make a thicker filling (AKA crust) along the bottom and sides.